Read chosen columns from an input table into the job. The difference between Table Input and Multi Table Input is that Multi Table Input reads data from many input tables based on filtering all available input tables matching a pattern. The matching tables are expected to be very similar, e.g. Budgets_2012, Budget_2013 and so on, with a common set of columns. Schema Select Select the table schema. The special value, [Environmental Default] will use the schema defined in the environment. For more information on using multiple schemas, see this article. Pattern Text The pattern to match available tables to. The pattern syntax depends upon the chosen Pattern Type (see below). 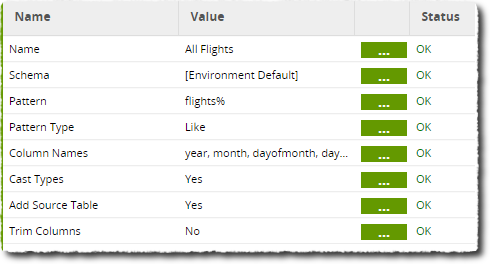 Pattern Type Select Like – The available tables are filtered using an SQL Like comparison. See Redshift Like documentation. Similar To – The available tables are filtered using an SQL Similar To comparison. See Redshift Similar To documentation. Regex – The available tables are filtered using a POSIX Regular Expression comparison. See Redshift Regular Expression documentation. 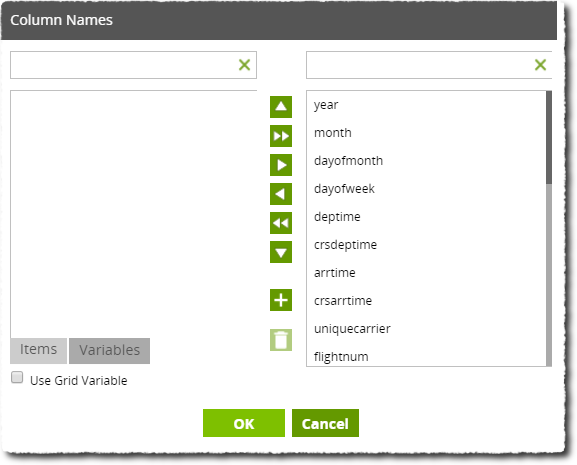 Column Names Choice The available column names are generated by first scanning the available tables, and then providing all column names from any of the inputs. It is expected that the tables matching the pattern are fairly similar and share many columns. 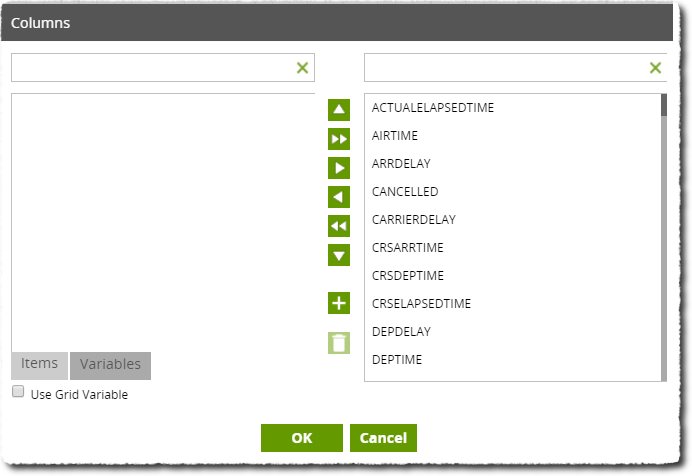 Cast Types Yes / No Yes – If the same-named column from multiple tables has a different data type, attempt to cast to a common type. Default is No. No – If the same-named column from multiple tables has a different data type, it is reported as an error. Default is No. Add Source Table Name Yes / No When set to Yes, add an additional column, "source_table" containing the input table name that was matched to provide this row. Trim Columns Select Wraps the column names in a BTRIM function, which will strip out all the leading and trailing spaces. See the Redshift documentation for details. Pattern Type Select ILike – The available tables are filtered using a case-insensitive SQL syntax pattern. See Snowflake ILike documentation. Like – The available tables are filtered using a case-sensitive SQL syntax pattern. See Snowflake Like documentation. Regex – The available tables are filtered using a POSIX EXE Regular Expression comparison. See Snowflake Regex documentation. Pattern Text The pattern to match available tables to. The pattern syntax depends upon the chosen Pattern Type (see above). Columns Choice The available columns are generated by first scanning the available tables, and then providing all columns from any of the inputs. It is expected that the tables matching the pattern are fairly similar and share many columns. Use the Editor to select which columns to pass along. Cast Types True / False True – If the same-named column from multiple tables has a different data type, attempt to cast to a common type. Default is False. False – If the same-named column from multiple tables has a different data type, it is reported as an error. Default is False. Add Source Table Name True / False When set to True, Matillion adds an additional column, "source_table", containing the input table name that was matched to provide this row. Generates a set of select statements, concatenated together using UNION. 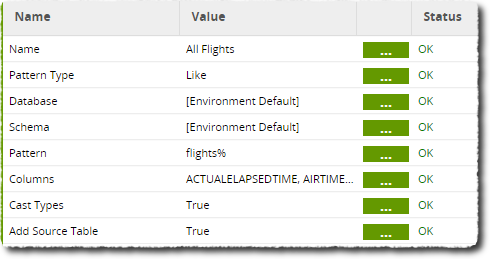 This job reads data from all tables that start with the prefix 'flight' using an SQL Like pattern. The Pattern uses the % wildcard, since that is the multi-character wildcard used in a Like filter. All available columns are chosen.